Mixture of casein and whey in a 80:20 ratio. 100% Pure casein. Slow absorption protein. Without sugar! Maximum quality micellar casein with Digezyme®. In house production, more proteins per serving and milk from grass-fed cows. Improved flavor and texture! Slow release protein. 100% pure raw material. Micellar Casein rich in BCAA´s and Glutamine. Anti-catabolic effect. Slow-release whey and micellar casein protein. Micellar casein before going to sleep. Slow or sustained release protein. Michelle XL  micellar casein. With L-theanine and Glutamine. Micellar casein and whey protein isolate. 23g of casein protein with BCAAs. High quality protein, processed by cold microfiltration. It retains the protein fractions intact. High quality micellar casein. Enriched with vitamins. Sustained release protein, ideal for before bed and for prolonging anabolism. PeptoPro® hydrolyzed casein protein clinically tested. Maybe I do not know how to do it right, but it gets a little foamy when I mix it with milk. The results are excellent though, you can truly feel its satiating effect. Buy Caseins - All you need to know! Casein produces a long saturation and provides the body with essential amino acids, which are slowly released even after 7h of their consumption. In this way, we are able to supply amino acids to the bloodstream and reduce muscle breakdown. Casein, is the best source of proteins from milk for sportspeople and those who follow a hyperproteic diet and who want to keep the correct habits to improve their recovery, sports performance, and even to mantain or gain weight. Casein is a protein that contains all the essential amino acids and helps to increase the biological value of vegetable proteins. It is a component of milk and it is also present in some of its derivatives, like cheese. Casein is in charge of the calcium and phosphate transport in the body and it supplies essential amino acids which cannot be synthesised by the body in a natural way. Casein is especially important for the growth and toning of the muscles. When it is ingested, casein forms a clot in the stomach that slows down the gastric emptying rate, which in turn affects the rate at which amino acids are absorbed into the bloodstream. In other words, because of this clot, casein takes longer to be digested in the stomach which slows down the amount of amino acids that are released into the small intestine where they are absorbed. What foods contain casein protein? What are the consequences of a lack of casein? 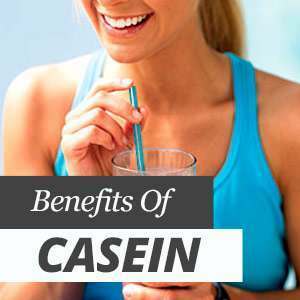 Who can especially benefit from casein? What do experts say about casein protein? The human body has 22 amino acids that combine differently with the proteins and which perform several bodily functions. Some amino acids are produced by our own bodies and others are obtained through the food that we consume. Casein contains essential amino acids, such as leucine, isoleucine, lysine, phenylalanine, and valine, which play a crucial role in the growth, formation, and definition of muscles. Due to this, casein is one of the favourite dietary supplements of athletes. Casein transports the calcium mineral and phosphate. This is essential for both newborn infants and adults. Calcium ensures the formation and stability of the bones and teeth and it is essential for muscle contractions, as well as for ensuring the stability of the cell membrane. The phosphate stored in casein is important because it interacts with calcium during bone formation and it is involved in the regulation of the acid-base balance. The essential amino acids contained in casein help with the formation of muscle mass, improve the quality of vegetable proteins, and facilitate calcium regeneration by the body. The amino acids of a casein protein have an additional effect on the serotonin neurotransmitter, which is very useful for those who follow a diet or who want to lose weight, since serotonin suppresses the appetite and may reduce food cravings when combined with casein's reduced digestion rate. Casein can be found in all dairy products, except for whey. The different types of milk differ in terms of their amino acids concentrations. Cow's milk has a high biological value and the proteins it contains can be successfully divided by the human body into its endogenous amino acids and be used to rebuild the proteins needed by the body. A severe lack of proteins can be seen in the bellies of malnourished children, whose bodies are simply storing water due to an extreme protein deficiency. Even though these images are usually associated to developing countries, these deficiencies also occur in developed Western countries. The risks of malnutrition and excessive diets should not be underestimated. An deficiency of the amino acids found in casein results in a deterioration of muscle tissue, lack of motivation, healing wounds problems, anxiety, and depression. In the worst circumstances, a calcium deficiency that is associated to a casein deficiency may cause the decalcification of the bones and osteoporosis. Casein is especially important for vegetarians whose diet excludes dairy products, since casein increases the biological value of vegetable proteins. Milk and its derivatives, such as cheese and curd, are the natural suppliers of casein protein. Protein powder, optimised with vitamins and other vital substances are available for athletes. Since casein protein is digested more slowly in the body than other proteins, the amino acids will be released over a longer period of time. Casein is usually consumed in the morning and evening. Consuming casein in the morning guarantees a good saturation, while at night, it guarantees an important amino acids long-term supply for muscle growth and repair. Casein is an excellent nutritional resource that helps to meet the daily protein requirements in our diets, and also benefit from its properties that relate to the continuous and sustained supply of amino acids, being a calcium source, and preventing catabolism (protein breakdown). Casein studies are mostly concerned about how it differs from whey protein, which is another very popular product among sportspeople and bodybuilders. Whey protein can be absorbed more quickly by the body and it is available for the muscle almost immediately. It is usually taken before or after training. Casein is the best protein choice if you wish to obtain the effects of amino acids during the night in order to repair and help with muscle growth, as well as to achieve a constant flow of amino acids for several hours. It is usually consumed between the main meals or in the evening. However the uses of casein and whey are not mutually exclusive. They can even be combined, for example, in a shake with a 2:1 proportion of whey + casein, favoring whey, we improve the overall amino acid profile and thus we get an excellent nutritional value that will help to stimulate MPS ("muscle protein synthesis" or "protein synthesis"), while at the same it will create a more long-lasting hormonal environment which encourages muscle tissue building.